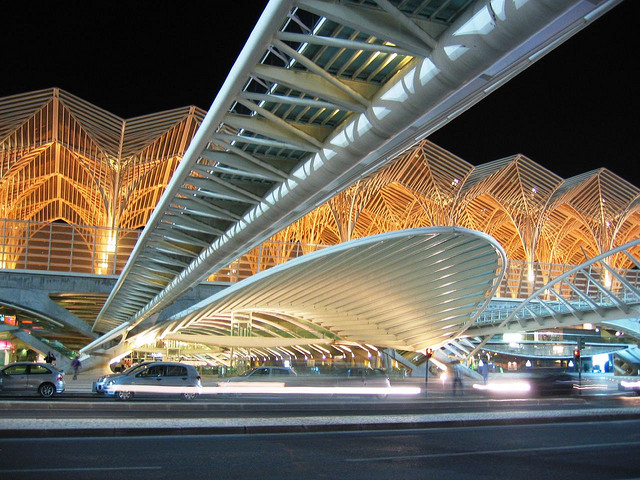 A very cool pic of the Gare do Oriente in Lisbon, Portugal, where passengers can board the local Metro, high-speed rail and other inter-city trains. It was designed by the renowned architect Santiago Calatrava, who also designed the future train station at the World Train Center site. Look how the train station is like a mall in itself bustling with so much business activity right then and there! With so much going on, I feel much safer than our lonely, dark, and dull train stations. Why can’t we have this? Why do we waste real estate of the train stations when they have so much potential like this? I want to see train station pictures from across the globe like this, especially how they use them as a place to promote business activity. In contrast we have the wasteful use of the Florence Blue Line Station with its ugly parking lots. That place could do much better by converting the entire north end of that parking lot to a covered business and retail area, complete with restroom facilities, and maybe a small food court which transit riders can sit & wait there until the train comes. Revenue earned from rental space will go back to the station maintenance and upkeep. The south end can be rebuilt to a two or three story parking lot to accomodate the lost parking space. Even better would be to get rid of the parking lot there altogether and rebuild it as the Florence Blue Line Station mini-mall. Metro has all these “hot real estate” that they own. Why waste them? Those places can bring in lots of revenue that can help Metro’s budget woes. Metro has been trying to get private investments near it rail stations. There seems to be a lot of interest in retail and housing developments on the lots owned by Metro near the East Side Extension stations but very little interest in the Blue, Green, and Orange Line corridors. Here is a map showing the status of all these developments.